3 days out from Spring & while I don't think this will change what the weather man is telling me, it will officially allow me to feel less awkward about going tight-less & pulling out every pastel, floral printed thing I own… all about having your mind right! So in celebration of Spring (& St. Patty's Day too!) 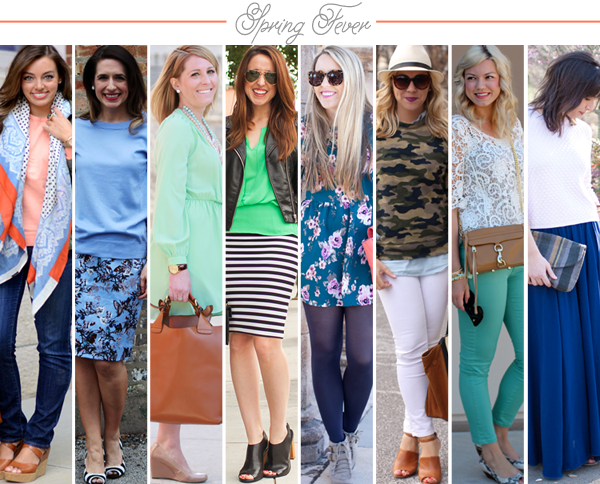 I'm happy to be joining forces yet again with my Bloggers Who Budget group, showing you Spring styles for less! I love this changing of seasons, evaluating the items that stay & the ones that go from my closet. Identifying the holes that I need to fill, & getting excited about my clothes again. I had the great pleasure of meeting the Le Tote team during my recent trip to San Francisco, exploring their fabulous studio office & playing dress-up in some of their new Spring arrivals. Wearing this top & skirt for just a little bit wasn't enough & I hope that these versatile pieces show up in my tote box soon! Have you signed up for their affordable clothing rental service yet? DO IT! What pieces are you excited about pulling out for Spring? Love this whole look! Eyeing those booties... I might need a pair. Nope the 28th-30th. Maybe we can grab some lunch or grab a brewski! Just let me know. Oh very cool... I will be galavanting around town with a bachelorette party, but we should totally try to squeeze something in! SO SO chic Jess! Love the leather jacket! I'm going to have to go to my local H&M and see if it is still available! Loving the bag and shoes! I'm digging the fact that mules are back this spring :) I'm most excited for bare legs – my jeans are getting me down! I am loving this look on you, Jessica! I love the idea of a skirt that you can wear at any length you choose. I love this look! I'm excited about pastel colors and floral prints! I'm so ready for warm weather to get here... someday? these are great photos! You look like a movie star. and those booties…so prime! you look great! i love that bag! Such a cute look! The emerald is just a great color. I think I need to make sure I check out Le Tote soon. Could you look more perfect? Nope. Not possible. Happy St. Patrick's Day! Great look and that bag is too cute! I am a big fan of stripe skirts and this one looks great on you! Love this outfit on you!! That purse and those shoes are too good!! So cute lady! Girl, so cute! You are like the freaking best at pairing 'tough girl' leather jackets with girly girl outfits! Seriously, and it looks so perfect together! Super love that shirt though!! I keep starring longingly at my collection of sun dresses. They keep tempting me but some are too light to be able to pull them out yet. :( I LOVE the pop of green and those booties are to die for!